Union County Manager Al Faella, Deputy County Manager Bill Reyes, Kathy Clark, supervising biologist with the DEP’s Endangered and Nongame Species Program, and Union County Freeholder Vice Chairman Bruce Bergen greet one of the recently born Peregrine Falcon Chicks. ELIZABETH, NJ–Four chicks were hatched by a pair of Peregrine Falcons nesting above the Union County Courthouse. 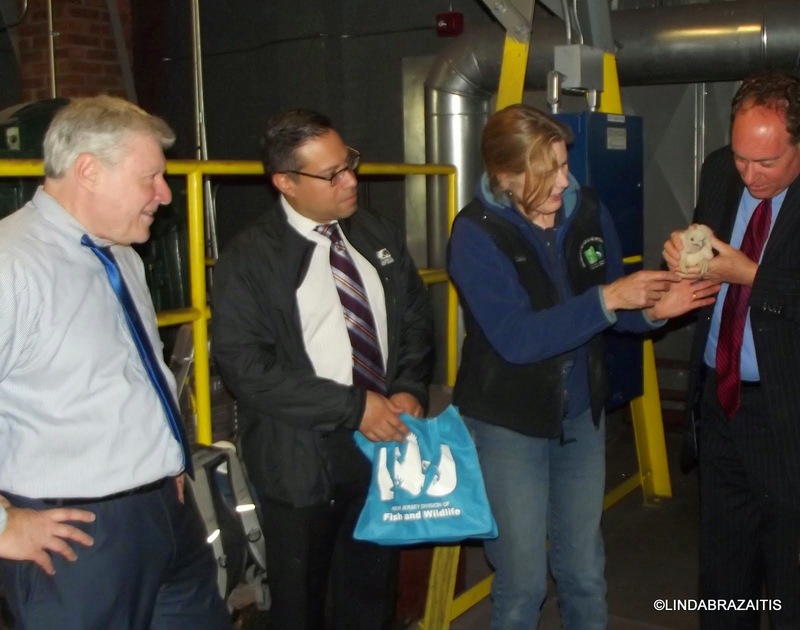 State and County naturalists banded one of the chicks, and County officials visited the nesting location on the rooftop of what is highest building in the City of Elizabeth. Peregrine falcons have been living on the courthouse tower for ten years They are crow-sized predatory birds and only 2,000-3,000 breeding pairs exist in Canada, Mexico and the United states, according to state wildlife officials. These falcons are known to be formidable hunters that prey on other birds (and bats) in mid-flight. Peregrines hunt from above and, after sighting their prey, drop into a steep, swift dive that can top 200 miles an hour (320 kilometers an hour). 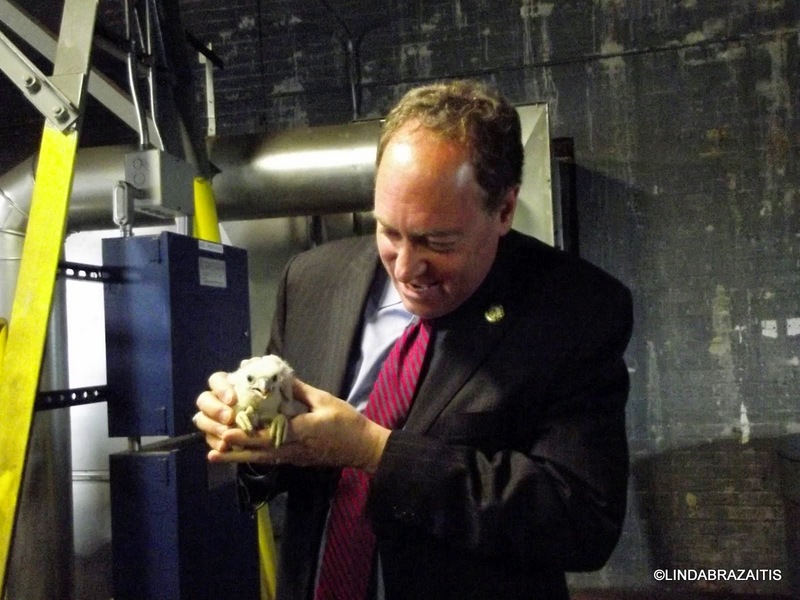 Freeholder Vice Chairman Bergen with one of the Peregrine Falcon chicks. Twenty-six pairs of peregrines now occupy appropriate nesting habitat in New Jersey. Peregrines can be found nesting on bridge towers, water towers, and high buildings. Some peregrine falcons relocated from New Jersey have even been used to help rebuild populations in West Virginia. Peregrines relocated from New Jersey between 2006 and 2011 have been confirmed inhabiting the mountain areas of West Virginia and western Maryland.